Liturgical poet; died in Castile in 1154; descendant of the Babylonian nasi Hezekiah. Many seliḥot bearing the signature of Ḥiyya (though whether all are by the subject of this article is uncertain) are found in the Maḥzors of Tlemçen, Oran, Avignon, and in the Sephardic Maḥzor. In the seliḥah the surname "Al-Daudi" is added to the name of Ḥiyya. 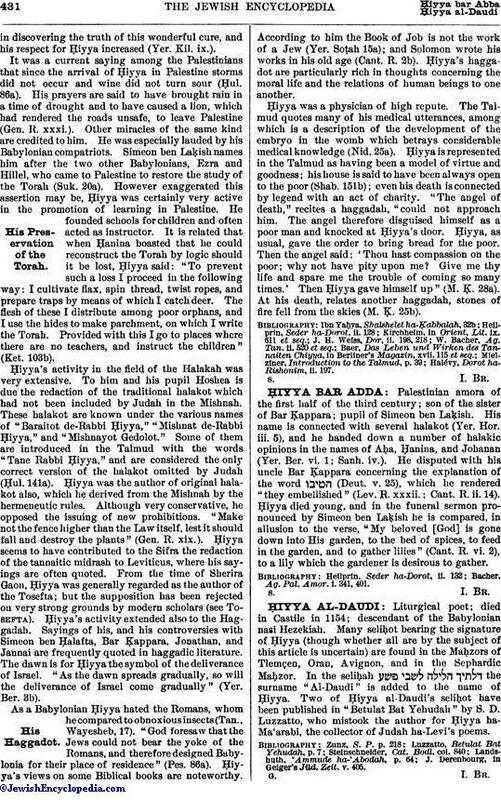 Two of Ḥiyya al-Daudi's seliḥot have been published in "Betulat Bat Yehudah" by S. D. Luzzatto, who mistook the author for Ḥiyya ha-Ma'arabi, the collector of Judah ha-Levi's poems. J. Derenbourg, in Geiger's Jüd. Zeit. v. 405.